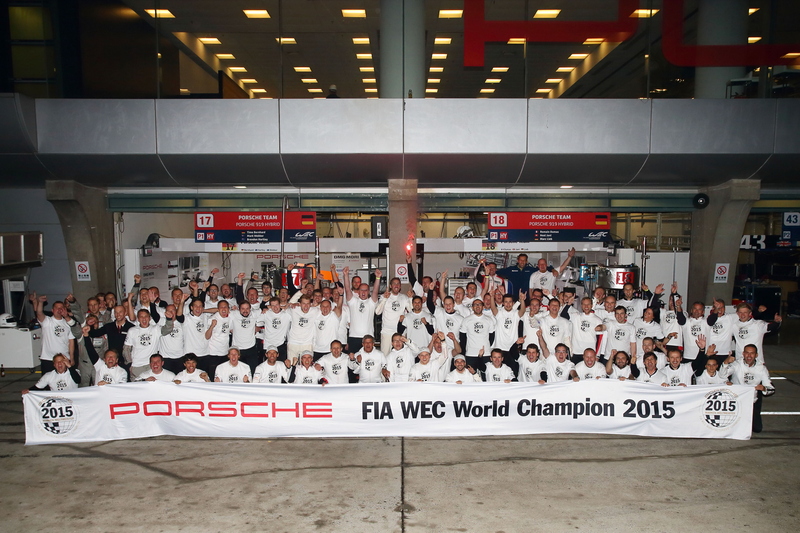 Mark Webber, Timo Bernhard and Brendon Hartley gave Porsche their fifth consecutive FIA World Endurance Championship race victory at the Six Hours of Shanghai, helping Weissach to wrap up a first world title since 1986. 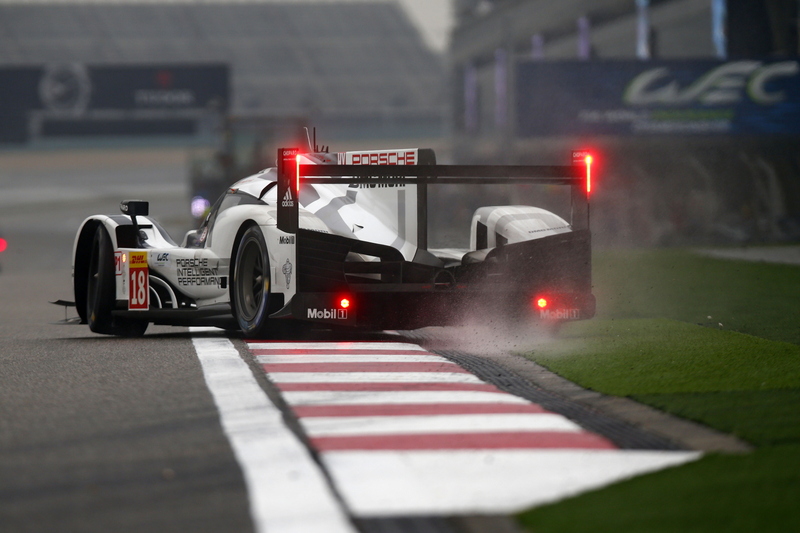 At the penultimate round of the 2015 season, held at the Shanghai International Circuit, the two Porsche 919 Hybrids once again locked out the front row of the grid with Hartley and Webber securing pole position in the no. 17 machine with an average lap time 0.769s faster than Dumas and Lieb in the no. 18 car. The dry and bright qualifying session of Saturday was replaced by plenty of rain for Sunday’s six-hour encounter however, with the race forced to start behind the safety car before going green at the end of lap four. Less than two years after returning to frontline competition, Porsche has secured its first world championship since 1986. Lieb briefly took the lead as Hartley struggled with a boost issue however, the Kiwi was quickly back at the head of the field as the no. 18 Porsche was forced into a spin by the no. 7 Audi, dropping to the back of the pack. Hartley’s stint continued uneventfully until he handed the no. 17 car over to Timo Bernhard, briefly dropping behind the two Audis (who had yet to stop for fuel or fresh wet tyres). On lap 61, Neel Jani – now at the wheel of the no. 18 Porsche 919 after Lieb handed over during a caution period – took the lead with Bernhard content to sit behind the sister car until lap 101 when the positions were reversed as the no. 17 Porsche’s pace improved. In difficult conditions, the no. 18 Porsche Team crew pushed hard but couldn’t oust the no. 17 car from the top spot. Webber took the helm on lap 115 with the track now dry enough for the Michelin ‘hybrid’ intermediate (a slick tyre with a softer compound). The Australian ex-F1 star continued to lead until a stop on lap 154 for full slick tyres handed the lead back to the no. 18 entry, now driven by Romain Dumas. The Frenchman was forced to make a splash-and-dash fuel stop on lap 162 though, giving the victory to the Webber/Hartley/Bernhard Porsche (the trio’s fourth consecutive WEC win) while second place for the no. 18 919 helped secure the 2015 manufacturers’ world championship. In the GTE-Pro class, Porsche also took victory with the no. 91 Porsche 911 RSR of Richard Lietz and Michael Christensen coming from fifth on the grid to win, while the second Porsche Team Manthey 991 of Patrick Pilet and Frédéric Makowiecki finished third. A third win for the no. 91 Porsche 911 RSR helped strengthen Weissach’s lead in two of the GT standings heading into the finale in Bahrain. Traditionally strong in wet conditions, the two Porsche 911 RSRs made good progress in the early stages of the race as Makowiecki moved from fourth to second within five laps, one place ahead of Lietz. The latter though would soon be in the lead, laying the foundations for the no. 91 crew’s third win of 2015. Behind, a spin for Makowiecki dropped the no. 92 RSR to sixth before Pilet got the second Porsche 911 back into the podium places. The result strengthens Lietz’s advantage atop the drivers’ championship (which he now leads by 18 points from Christensen) while the no. 91 squad now also leads the teams’ title chase. Heading into the final round in Bahrain, Porsche is just four points behind Ferrari in the GT manufacturers’ standings too. For all the latest Porsche race reports and news, make sure you check out our dedicated motorsport section. Richard Lietz (second left) now leads the GT drivers’ championship by 18 points from teammate, Christensen (far left).